Welcome to PyPubSub’s Home Page! PyPubSub provides the infrastructure for using the Observer pattern in your single-process application. It is pure Python and works on Python 3.3+. Using the Observer pattern in your single-process application can dramatically simplify its design and improve testability. The Observer allows code to observe “messages”, without knowing anything about the source of the message (which Python object or function), and in turn allows code to emit messages without any regard for which code will receive the message (it may not be received at all), what the receiving code will do with the message, etc. Basically the Observer pattern is like a radio broadcast, it is a one-way message sent, the only contract is in the message content: the receiver/listener must have the ability to decode the message. A classic example where PyPubSub could be useful: a GUI application. How do components like views and dialogs communicate their changes to one another? Without a publish-subscribe mechanism, the code can become a real spaghetti. PyPubSub makes it easy for your code to emit messages, and other code, in the same process, to receive those messages. PyPubSub takes care of the plumbing. Message Sender: The sender of a PyPubSub message is the ccode that calls pub.sendMessage(). Message Topic: a. Every message is specific to a “topic”, defined as a string name; b. Topics form a hierarchy. A parent topic is more generic than a child topic. Once the MDS is set for a topic, it never changes during the runtime of an application. Message Listener: All message listeners are callables that get registered with PyPubSub in order to receive messages of a given topic, and must have a signature that is compatible with the topic’s MDS. Messages sent will be delivered to all registered listeners of a given topic; this includes listeners of the topic, parent topic, etc. Hence the root of all topics (called ALL_TOPICS) receives all messages. Sequence of delivery is unspecified and can change at any time. This is fundamental to the Observer pattern, and your application’s listeners must be designed to not depend on the order in which they receive a given message. Messages are delivered synchronously: a listener must return or throw an exception before the message is delivered to the next listener. A listener that raises an exception does not prevent remaining listeners from receiving the message. A message sent will be delivered to all registered listeners of the specified topic before control is returned to the sender. Message Immutability: message contents must be left unchanged by listeners, but PyPubSub does not verify this. 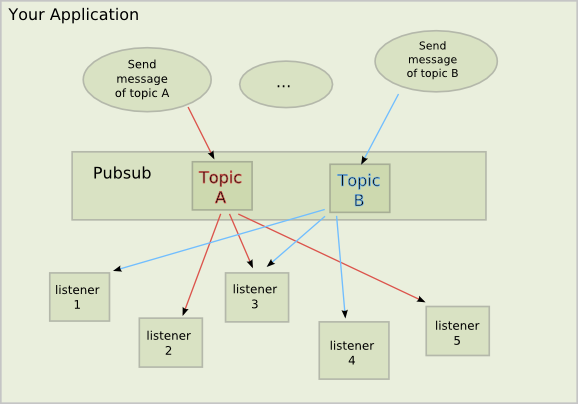 Message Direction: a message is one-way from sender to set-of-listeners; PyPubSub does not support “answering” with a response from each listener to the sender. This could, of course, be achieved by having the sender include a callback as message data, and each listener calling that callback with agreed-upon data, but this (typically) increases coupling. Message Source: PyPubSub does not provide any information to the listeners regarding the origin (aka source, or provenance) of a message. The sender could, of course, include such information with the message data, but this is not recommended as it defeats the purpose of the Observer pattern. PyPybSub was originally written by Robb Shecter as wx.lib.pubsub in wxPython 2.x, sometime around y2k. Robb and the wxPython author, Robin Dunn, allowed me to take over the package around 2003, and I moved it out into a standalone package (no dependencies on wxPython) around 2006 with their approval. I hosted the code on SourceForget.net for about 10 years, then moved it to github sometime in 2016. The code is very mature and stable. See History for details on its history and Roadmap for possible future work. © Copyright Oliver Schoenborn (since 2006). Last updated on Jan 28, 2019. Created using Sphinx 1.7.9.